Exporting all except certain columns. Exportable actions expose a few convenience methods that make customizing your resource exports a breeze. By default the filename of the export is generated based on the plural form of the resource name. For a User resource this would be users.xlsx. If you want to customize this, you can easily use the withFilename() method on the action. The file will now be downloaded as e.g. users-1535273559.xlsx. By default the writer type of the export is based on the file extension of the filename. When not using any custom filename, this will be .xlsx. If you want to customize this, you can easily use the withWriterType() method on the action. The file will now be downloaded in the csv format. You can find a full list of writer types at Export formats. By default the Export will be stored in the default storage disk. By default the Export doesn't contain a heading row. If you want this, you can use the withHeadings method. This will result into each column having their corresponding column name as first row. If you want more control, you can pass in the headings yourself. # Exporting only certain columns. If you want to select only a few columns for your export, you can use ->only(). # Exporting all except certain columns. If you want to leave out a few columns in your export, you can use ->except(). It will now export all index fields except the ones you specified. If you want to export all fields except some, you can combine allFields() with except(). By default we chunk the resource query in chunks of 200, if you want to change this for performance reasons, you can use the withChunkCount() method. By default both ExportToExcel and DownloadExcel send notifications to the user when an export is failed or succeeded. If you want to customize this, you can use the onSuccess or onFailure callbacks. Using onSuccess on DownloadExcel expects a Action::download to be returned! Just like in Laravel Excel it's possible to chain extra jobs to the export queue when using the QueuedExport. You could e.g. notify the user about the export completion. If you want to gain full control over your resource exports, you can choose to create your own actions. If you create a custom action it should either extend from ExportToExcel or DownloadExcel, depending on the functionality you want to use. 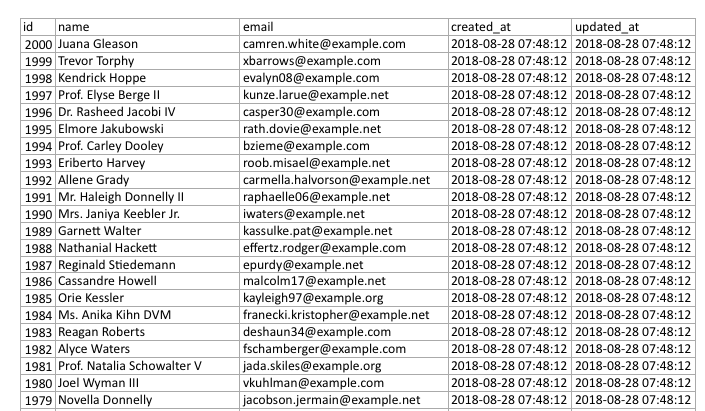 Just like in the base package Laravel Excel you can apply concerns to your action. E.g. we could add a WithMapping concern to the action. Now when exporting the resource it will first map each row, before exporting it.